As patron of the Heart Association Mary today visited the maternity ward at Rigshospitalet, where she herself gave birth. Here she saw a heart-scanner in action, scanning newly born Karl Emil. This is an offer called Copenhagen Bay Heart, where all new-born are offered to be scanned for heart-failures. The point of course being to spot any problems as soon as possible. Søren Hedegaard caused a lot of stir recently, because he resigned as head of the maternity ward in protest at the 2% savings all Danish hospital have had to meet over now many years. While that does have decreased inefficiency and reduced excess spending, these goals are now so unrealistic that it effects patient-security, not to mention the work-environment for the employees. - IMO another example of economists setting up targets that look good on Power Point, but has little to do with the people who it is affecting. Even though some politicians actually tried, it is difficult to tell one of the most experienced and competent pediatricians in DK that he doesn't know what he is talking about... So the politicians are finally about to scrap the 2% yearly savings. - I'm sure some Danish members, like Roskilde, could write a 5.000 word comment to that! thank you Muhler. I always enjoy reading your excellent extra info, it adds a lot to this forum . A little question for the English-speakers: When does a baby become a toddler? - When they begin to walk? Or speak? And when do they stop being a toddler? Thanks for the pictures from Mary's two events today. One thing I will mention which I think says a lot about Mary. Several writes enthusiastically how Crown Princess Mary during her visit at the maternity ward at Rigshospitalet, also stuck her head in and said 'hello' to other departments in the hospital on her way home. It's such a little thing that means ALOT to people! By accident Mary losed a single red rose from her bouquet as the flower girl Alma had give Mary upon arrival. With a quick snap Crown Princess Mary catched the deep red rose from the floor and surprised everyone by giving it to Alma. Thanks for all the pictures and articles of Mary with the Heart-children. Summary of article in Billed Bladet #04, 2017. As you know by now Mary recently visited Rigshospitalet as patron of the Heart- and Heart Children's Foundation to present a grant. Here she was received by nine year old Alma, who apart from having a heart condition also suffer from William's Syndrome (which I don't know what is). Mary said about Alma: She's so neat and sweet and so kind". Alma underwent a heart-surgery when she was 2½ months old. Later Mary posed with Alma's parents and two brothers. Alma's mother said: "Alma has been looking so much forward to today. She's been talking about it for the past two weeks". Mary met other children with heart conditions and presented the grant. But she also visited he maternity ward at Rigshospitalet, to see the new heart-scanner in action. The aim being to offer a scan to all newborn in order to deal with heart conditions as soon as possible. That is known as Copenhagen Baby Heart Project. Here she also met Morten Hedegaard, who was in charge when she gave birth to her four children and he was the only doctor who got a hug by Mary. Mary said about the project afterwards: "Copenhagen Baby Heart is a unique project, which will have a very big significance. I have today seen a scanning of the heart of a newborn. It was a life-affirming experience to see the little heart work and hear the little heart-beats". Q: What is your (informal) favorite color? M: "I love so many different colors. I like blue and lilac". Q: How is Your (formal) mother-in-law? M: "My mother-in-law, Queen Margrethe, is really, really well". M: "I actually have a very versatile taste in music. I like everything from Foo Fighters to Lukas Graham and classical". Q: What's your sisters called? M: "They are called Jane and Patricia". I should however caution you before seeing the article with PH playing bridge! - Sensitive viewers may find the photos disturbing. The coverage of the Icelandic state visit will be in the next issue of BB. At age 10 and 13 they have both been through heart surgery. It puts the daily grievances we have in perspective. Summary of article in Billed Bladet #41, 2018. 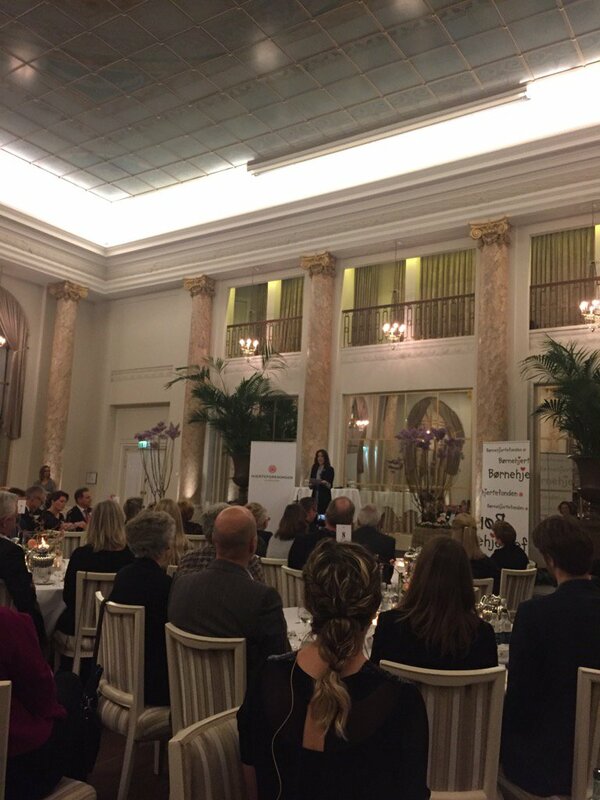 Mary were among those who celebrated the Heart Association at the esteemed Hotel D'Angleterre in Copenhagen recently. Here she presented two grants for each five million DKK (some 850.000 $) to two researchers. In her accompanying speech, Mary said: "Today we celebrate that we have become better at saving both small and big hearts. Today we pay tribute to the research which results and a new treatment. No one wish for their children to be born with a heart-defect. But when it happens we must do our best for the children to live in safe surroundings together with those dear to them." Mary met two children who suffers from heart-problems and had a chat with them. Christian who was born in 2007 with serious heart-defects and as such had to undergo surgery the very next day. He went through more surgery when he was seven months old and five years old. But it got even more serious when he at age eight contracted a flu. Despite intensive care for five weeks his heart was so weakened that he had to undergo a heart transplant and that took place in 2016. Elise was born with a serious heart-defect. It was discovered when she caught pneumonia at 18 months old. At age seven she went through a heart surgery and had a patch sewn to her heart. The two children got a long ovation from those present, so it was a good day for them.